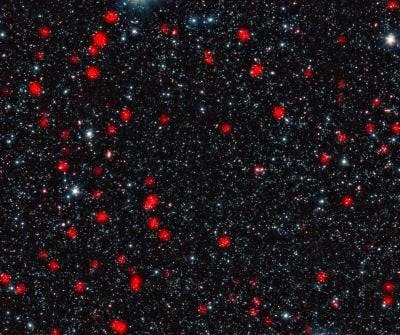 By studying how distant starburst galaxies are clustered together, astronomers have found that they eventually become so-called giant elliptical galaxies — the most massive galaxies in today's universe. The galaxies are so distant that their light has taken around ten billion years to reach us, so we see them as they were about ten billion years ago. "We know that massive elliptical galaxies stopped producing stars rather suddenly a long time ago, and are now passive. And scientists are wondering what could possibly be powerful enough to shut down an entire galaxy's starburst," says Julie Wardlow (University of California at Irvine, USA and Durham University, UK), a member of the team. The galaxies are so distant that their light has taken around ten billion years to reach us, so we see them as they were about ten billion years ago. In these snapshots from the early Universe, the galaxies are undergoing the most intense type of star formation activity known, called a starburst. "In short, the galaxies' glory days of intense star formation also doom them by feeding the giant black hole at their centre, which then rapidly blows away or destroys the star-forming clouds," explains David Alexander (Durham University, UK), a member of the team.